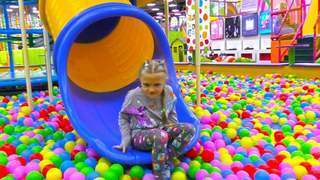 The indoor playground is a fun place for Elli and you can see that in her face as she plays in this kid blog episode. Watch her go down the slide, spin around, jump, open locks, play the xylophone, and run around while having fun. As she explores the indoor playground, you’ll also get to listen to nursery rhymes like Wheels On The Bus and Dance Like Shark Family. Keep learning with Elli by watching her other videos at SeeZisKids.com.